Go green and save green on a personalized journey to Ireland and Scotland with Brendan Vacations. The Celtic experts are celebrating St. Patrick’s Day by sharing their pot of gold with an exclusive four-day only $500 air credit per couple*. Ireland boasts an ancient culture of warm, friendly people waiting to share their scenic homelands. 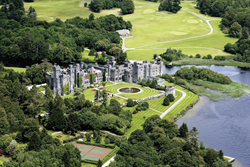 Live like royalty and stay at the luxurious 800-year-old medieval Ashford Castle, the former home of the Guinness Beer family and recently restored by Brendan sister company Red Carnation Hotels. Get awestruck by the Neolithic tombs at Newgrange that are 500 years older than the Egyptian Pyramids and England’s Stonehenge. The local Brendan team is dedicated to taking travelers personally however they prefer to travel. Four different trip styles have been carefully crafted to meet individual interests and support preferences: Perfectly-planned Guided Vacations with a Travel Director providing concierge-style service the entire trip, customizable Private Chauffeur, Locally Hosted Rail or Self-Drive. To book a Brendan vacation, please call the Brendan Experts at 800-687-1002 or contact a travel professional. View details of the St. Patrick’s Day Sale here. Brendan Vacations is the premier Ireland and Scotland destination expert, backed by over 45 years of planning authentic Celtic travel experiences from its office in the heart of Dublin. Offering a comprehensive range of travel styles, from Guided Vacations to customizable Private Chauffeur, Locally Hosted and Self-Drive offerings, each trip introduces Brendan guests to the local people passionate about sharing their stories and their homelands. For more, visit: BrendanVacations.com, facebook.com/BrendanVacations, twitter.com/TravelBrendan, instagram.com/BrendanVacations.